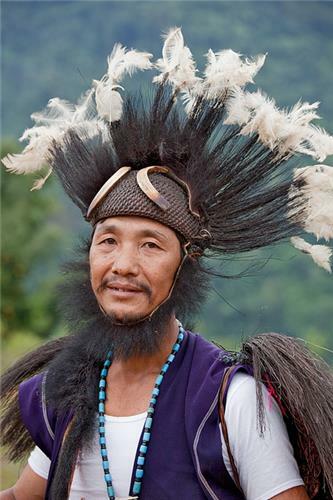 The state of Arunachal Pradesh, located in the far northeastern part of India, is a land of diverse tribes and races. These different tribes and communities have unique culture of their own which is manifested in its distinctive dance forms, art and craft forms, food and festivals. The diversity of ethnic groups, languages and religion is seen all over the state. Let us know more about the culture of Arunachal Pradesh. Broadly, there are three cultural groups known for their distinct socio-religious practices. The first group includes the Monpas and Sherdukpens of Tawang and West Kameng districts. They follow the Lamaistic tradition of Mahayana Buddhism. The second group forms with the people of Adis, Mishmis, Bangnis, Akas, Apatanis, Thongsas, Nishis, Mijis, among others who worship Sun and Moon God. The third group comprises of people of the Noctes and Wanchos tribal communities. They are mostly found in the Tirap district. The people have their strict village society headed by a hereditary chief who plays significant role in varied situations. The Noctes are followers of an elementary form of Vaishnavism. Arunachal Pradesh is a land of varied art and crafts. Since time immemorial the art of craftsmanship existed in the land. The range of works include weaving, painting, cane and bamboo work, carpet making, wood carving, ornaments, pottery, smithy work, basketry among others. The womenfolk of the state are expert in handicraft and hand loom. The Buddhist community in the state is good weavers. The Apatani tribe weaves shawls and jackets. The Adi community is famous for shoulder bag. The Mishimi coat and shawls are very warm. 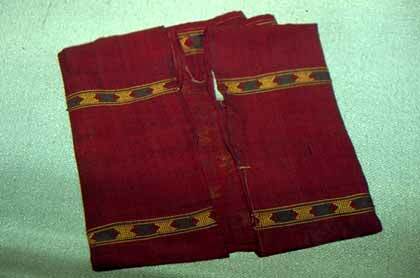 The womenfolk of Arunachal Pradesh are good weavers. They weave their beautiful traditional attire and other dress like shawls, scarves, blouse and jackets, Adi skirts and Apatani jackets. They also weave beautiful bags. Black, yellow, dark blue, scarlet, green and madder are the favorite colors among the tribes in Arunachal. They use both the natural and synthetic dyes. The government opened many weaving centers in the state to promote the weaving activity. The Wangcho tribe weaves beautiful Wangcho bags. They use cotton yarn and acrylic yarn to make these bags. 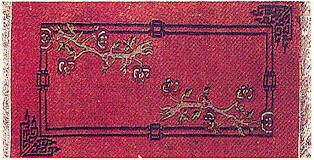 The Monapa tribe has special skill in carpet making. Repetitive geometric patterns, flora and fauna, semi mythical and mythical items like tigers, dragons are used to decorate the carpets. They use varieties of colors. They weave carpets for personal use, however nowadays it has become a major occupation. The government of Arunachal Pradesh has taken steps to regularize the sale and purchase of carpets to stop chances of smuggling and to ensure the benefit to the weavers. Cane and bamboo products of Arunachal are highly regarded. Bamboo and cane are used to make handicrafts and household utilities. Through these materials they make many daily need products like baskets, mats, belts, attractive smoking pipes, jewelry, can cap, head gear, and cane vessels. These items are available in various districts of Arunachal Pradesh. These works represents their local technology, cultural identity, design and quality. They also make beautiful baskets. Twill and hexagon are the two basic techniques used in basketry. Many tribes of Arunachal Pradesh have a tradition of carving wood. The Monpa, Khamti and Wangcho tribes are some of them. They make beautiful bamboo mugs, dishes, fruit bowls and masks. Images of Lord Buddha, dancers, animal figurines, warriors and miniature of Morung are the famous wood carvings. The people of Arunachal Pradesh also show their expertise in ornament making. They make different designs of ornaments. They use different color wings of birds and beetles to decorate the ornaments. Bamboo bangles and ear ornaments are mostly created by the Aka community. The Wancho girls are expert in bead work. The Mishimi tribe has skill in making silver ornaments. The Mishimi women’s wears silver fillet necklace with locket and earrings. The Apatani women’s wear nose plugs of bamboo. The tribes of Arunachal have another skill in black smithy. They use metal to make weapons and tools like arrowheads, knives, and iron bracelets. Arunachal Pradesh is located in the farthermost north east border of the country. As it is inhabited by tribal communities and covered by the Himalayas, the dishes of the state differ according to the region and tribal influence. Rice is the staple food in the state along with fish, meat and green vegetables. Among the vegetables, lettuce is mostly preferred by boiling with green chilies, coriander and ginger. Spices are not much taken by the people. Thukpa is another traditional dish taken by the people of the Monpa tribe. Apang or rice beer prepared by fermented rice and millet is a popular beverage taken here. There are other types of rice beer taken by the people. Boiled rice cakes wrapped in leaves is a favorite snack of the people. Momos are also preferred by the people. These are alcoholic drinks taken with traditional food. Momo and boiled rice cakes are also other snack food types taken by the people. The food preparation method differs among the people accordingly. The Monpa cuisine is popular for the tastes and beautiful use of chilly in their foods. Butter tea is an important beverage of the Monpas in addition to alcoholic drinks which are consumed by both men and women. Monpas are mostly non vegetarians and their favorite dishes include Momos, Zan, Khura, Gyapa-Khazi, Pua and Kyola among others. 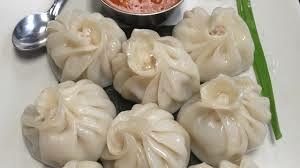 Momos are prepared by stuffing mixture of minced meat and onion in dough. They are then steamed for about half an hour in a three tied perforated utensil placed about another utensil containing water. Zan is prepared from millets or other favored flour to boiling water. After that, it is strived with a flat wooden appliance and taken with any cooked vegetable or meat to which fermented cheese and soybean is added. Khura is a Monpa pancake which requires little quantity of water to be added to flour and stirred until it turns into a thick paste and is kept near the hearth throughout the night for the cake to become soft. Then it is spread into a frying pan in little amount of oil and fried and taken with tea. Gyapa-Khazi is a Monpa version of pulao. It is prepared by mixing rice, fermented cheese, small dried fish, chilies and ginger. 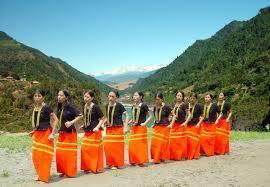 The people of Arunachal Pradesh are patrons of dance and music. They dance and sing on important occasions – during festivals and marriages. Dances are different for different tribal groups. They vary from highly stylized religious dance dramas of the Buddhists to the martial steps and colorful performances of the Noctes and Wanchos. Most of the dances are performed in groups – where both males and females take part. However, in some dances females are not allowed to dance with the male dancers. These dances are Igu dance of the Mishmi priests, war dances of the Adis, Noctes and Wanchos, and ritualistic dances of the Buddhist tribes. 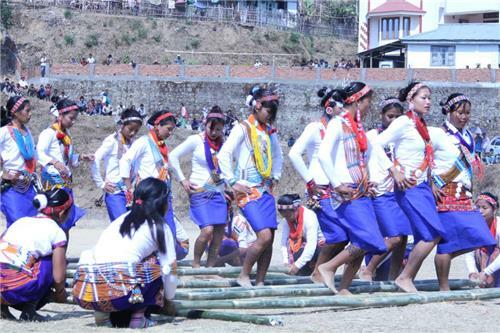 The Wancho tribe of Arunachal Pradesh celebrates Wancho dance. The dance is performed only in festivals and ceremonies. The Wancho dance is performed inside the house of chief authority. The male-folk, youths and adults take part in the dance. The male performers sing song and take short steps with their right foot towards right. They also deck themselves with cane baskets that hang behind them. The menfolk wear special dresses. They wear anklets of straw and girdles and a band of cowries on their shank. They also wear woolen threads of ear plugs on their ears and head dresses. The Khampti dance is also known as Kapung, which literary means a story that is depicted through dances. The Khampti peoples perform the Khampti dance. It is one kind of a folk dance. This dance is performed during the religious festivals. The dance unfolds the myths and stories of moral values. Khampti dance is generally perform in the monasteries. The dancers are invited by the wealthy people to perform in their courtyard. The Buiya dance is performed by the Digaru Mishmi people. It is performed for entertainment and performed during the Duiya, Tanuya and Tazampu festival. The dance brings prosperity and vitality among the tribe. There are no limits of age of the participants for the dance. This dance does not need any traditional wear. Participants wear usual dress for the dance. Participants play musical instruments like drum, gong and cymbals. The Adi tribe performs the Ponung dance. The Ponung dance is accompanied by song. Both men and women participates in the dance. It is organized in all the major occasions in the region. The boys and girls form in separate groups. The girls dance in a circle by holding each other. A man generally called Miri dances and sings around the circle. He also play musical instrument. The Reh Festival is associated with the Idu Mishimis. This tribe believe that they are the son and daughter of the divine Nayi Inyitaya. They perform puja and a number of buffaloes are scarified to Nayi Inyitaya during the festival. The festival is celebrated during February-August. The people living in snow fall areas celebrate it during summer and monsoon. The festival lasts for six days and the Naya dance is performed in the night. The Losar Festival is celebrated in the New Years Day in Arunachal Pradesh. 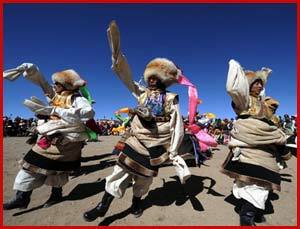 Losar is a festival to celebrate the New Year of the Monpa and Sherdukpen tribes of Arunachal Pradesh. It is the major festival of the Monapa tribe. They pray for good health and prosperity in this festival. Buddhist scriptures are read and butter lamps are lit in almost all houses and the campuses. The festival is especially celebrated in Bomdila and Tawang with feats, masked dances and special prayer sessions at monasteries. Tamaladu Festival is an important festival of the Digaru Mishimi tribe. Religious, social and supernatural beliefs are displayed in the festival. The main objective to celebrate this festival is to protect their village, animals and people from any natural disaster. The tribe offer prayers to the God of the Water and God of the Earth. The Khan Festival is celebrated by the Miji tribe. It is one kind of a religious festival and the social and cultural beliefs are seen in it. The local tribes do not discriminate themselves in this festival. Mopin Festival is an important festival of the Adi tribe. This festival is celebrated for wealth, peace, prosperity, wisdom and gets rid of natural calamities, diseases and effects of evil spirit. It is celebrated in the month of April and lasts for five days. The Popir dance is performed during the festival. The Mol Festival is a pre harvest festival and important festival celebrated in Arunachal Pradesh. It is mostly celebrated by the Tangsa community. Drums, gongs, cymbals and folk songs are performed during the festival. Nyokum Festival is celebrated by the Nyishi community of Arunachal Pradesh. Cultural heritage and ethnicity of the tribe is displayed in the festival. The head priest performs rituals and prayers are offered to the spirit to bring peace, harmony and prosperity to the people. Traditional dance and traditional art forms are performed during the festival. Solung Festival is the main festival celebrated by the Adi tribe. It is celebrated for five days. Solung Puja is performed during the festival to the Goddesses of wealth. It is celebrated to reap a rich harvest after sowing of seeds and transplantation of paddy plants. Dree Festival is celebrated by the Apatani tribe. Domestic fowls, animals and eggs are sacrificed during the fest. A few rites are also performed during the fest. The main objective of the festival is to appease the gods so that famine could be avoided. Traditional songs and dances are performed in the festival.